Looking for a compact machine to get your production operation off the ground, or for the manufacture of small and precise parts? The Plasmaster is the perfect solution, built using high quality components from Lincoln Electric and Burny, this small footprint machine is sure to be the tool to kick start production. As with all Kerf installations, this turnkey solution comes installed with all software, training, and support you’ll need to start cutting. 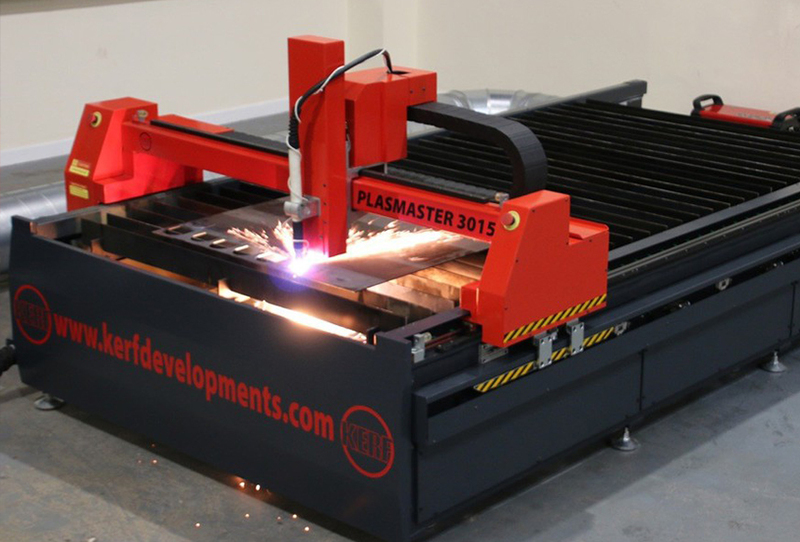 Ideal for a range of plasma cutting applications the Plasmaster is a modern designed machine with a small footprint making it ideal for smaller workshops. The Plasmaster can be supplied with a choice of plasma units to suit customers’ requirements, with systems available for materials from 1mm galvanised plate through to 25mm thick mild steel. The 125 amp Lincoln Electric Flexcut plasma is an excellent air plasma suitable for a range of applications in material up to 25mm thick. The Plasmaster machine is also available with the latest Lincoln Electric Flexcut 200 plasma unit which offers excellent cut quality with FineLine cutting technology which offers high quality plasma cutting of 25mm thick material on a compact size machine. All machines supplied by Kerf are built to the highest engineering standards and will provide years of reliable operation. The Plasmaster machines will retain high residual values based on their use of best in class components and build quality. To find out more about our Plasmaster machine please don't hesitate to get in touch for free advice or to book a demonstration.